Hello, World! It’s Friday, June 23rd and according to my calendar reminders, it’s time for the weekly load of tech goodness aka the weekly tech news. This week we have a lot of exciting news from the world of tech, the list includes Snapchat’s latest acquisition worth $350 Million, OnePlus finally releasing their overhyped 2017 flagship the OnePlus 5, Facebook announcing a new feature for Indian users, Snapchat launches a new location sharing feature, and Google launching a new search engine for jobs. That’s a lot of exciting news we have to cover so without any more delay, let’s get right into it. Snap, the company behind Snapchat and the uber popular spectacles has seen a rough time after going public with their well awaited IPO. The company’s shares have plummeted significantly since the announcement. But all these troubles haven’t slowed down the Venice, California-based company. They recently closed an acquisition of a Paris-based startup Zenly. Zenly is a location sharing app and Snapchat’s newest feature which we’ve covered in detail in this post is based on top of Zenly. Zenly boasts 4 million downloads according to Sensor Tower. The app has the largest user base in France but also has a significant number of users in Asia which includes 12% in South Korea and 8% in Japan, according to the report. Zenly’s app lets users see where their friends currently are on a map using constant GPS in the background. People can then message these friends in the app to make plans to hang out. 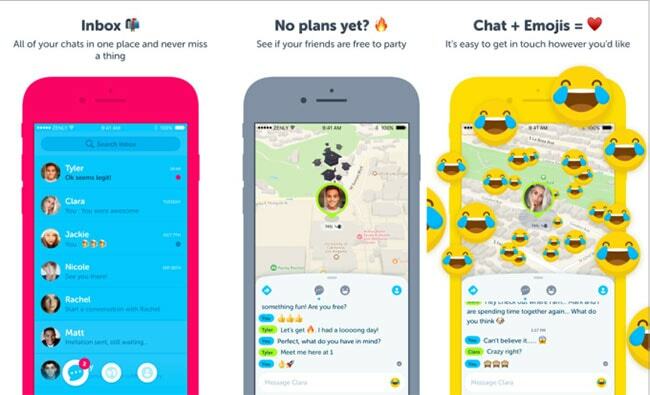 The app is mostly used by teens to keep up with their friends, in and around school or at a concert or other such events. Zenly had raised $35.1 million, including a $22.5 million Series B in September 2016 led by prestigious Silicon Valley venture capital firm Benchmark. Rather than shutting down Zenly and folding it into Snapchat, Snap Inc. will allow Zenly to run somewhat autonomously. With both Snap Map and Zenly, Snap Inc. is hedging its bets in the social content space. Because its Snapchat Stories feature is being aggressively copied by Instagram and Facebook’s other apps, Snapchat is wise to expand into the social utility space of helping people meet up offline. Now Snap could own two different apps on people’s home screens. While $250 million to $350 million may seem like a lot to pay for Zenly, Snapchat has seen many of its other expensive acquisitions turn out well. It bought Looksery for $150 million in cash and bonuses, which went on to power its iconic augmented reality face filters. It bought Bitstrips for $64.2 million, which has flourished as Snapchat’s Bitmoji personalized avatar stickers. Story Search, QR Snapcodes and its Spectacles glasses were all based on its acquisitions of Vurb, Scan.me and Vergence Labs, respectively. OnePlus is considered to be the new kid on the block when it comes to smartphones. They’ve had both successes with incredible handsets like the OnePlus One and OnePlus 3T and immense failure with devices like the OnePlus 2 and OnePlus X. In their 4 tears of existence, the company has seen both ups and downs. But one thing that remains the same about the company is their ability to shake up the industry significantly by launching devices attached prices you just can’t beat. This time they did it with the OnePlus 5, their 2017 flagship. Now, it’s obvious that the OnePlus 3T has only been 6 months old but OnePlus decided to follow the annual trend with their smartphone launch and they delighted their loyalties users with the new handset. Although the handset was leaked completely ahead of the launch, the hype still remained real with the new phone. Before anything, let’s get the specs out of the way. The OnePlus 5 sports a familiar 1080p AMOLED panel that we’ve all grown to like from the OnePlus 3 and OnePlus 3T. The phone is covered in metal and glass which screams premium from every angle. The popular alert slider is back with this phone. On the internals, the phone is powered by a Snapdragon 835 SoC and 6 GB or 8GB of RAM, yes there’s a crazy 8 GB RAM version. The memory optional include the usual 64GB and 128GB variants. Where the phone stands out is on the camera front. The OnePlus 5 has a dual camera setup like the iPhone 7 Plus. The sensor module comprises a 16 MP and a 20MP telephoto lens for that zoomed in shot and portrait mode with the bokeh effect. The front camera is a 16 MP sensor with electronic stabilization. 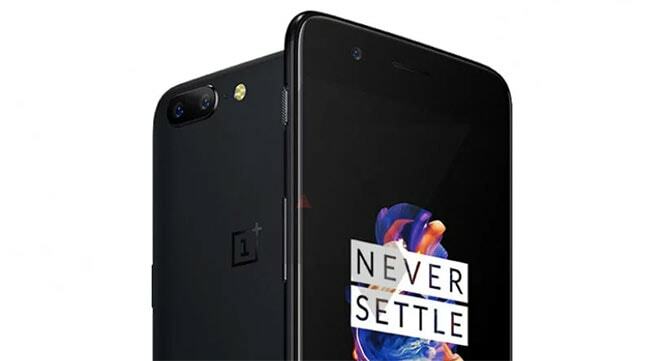 In terms of connectivity the phone rocks Bluetooth 5 and NFC, and we have a USB Type-C (USB 2.0 speed) but the battery on the phone is now 3,300 mAh only but according to OnePlus the software is optimized in such a way that it would easily last you a day. The Dual-SIM tray accepts two Nano-SIMs, and 4G is supported with VoLTE. Apart from the OnePlus 5’s brand new hardware, another big change is the slick new OxygenOS 4.5.0. It’s built on Android 7.1.1 Nougat and feels a bit more refined than before, with slightly smaller icons and text for the menus. There’s no app drawer button now as you simply swipe up to expand the dock, à la the Google Pixel. Swiping right takes you to Shelf, which lets you customize widgets for the weather, set reminders, see your recent apps, and monitor cellular data and storage usage. This can be disabled if needed. Long-pressing the icons of compatible apps brings up Nougat’s shortcuts to commonly used features. In terms of pricing, the 6 GB version will set you back ₹32,999 (i.e. $479) while the 8GB version will cost you ₹37,9999 (i.e. $539) which certainly seems a bit too pricey. What will be interesting to see with the OnePlus 5 is if the company continues supporting the existing OnePlus 3 and 3T as the OnePlus 2 and X have seen a pretty terrible demise with no software update upwards of Marshmallow. 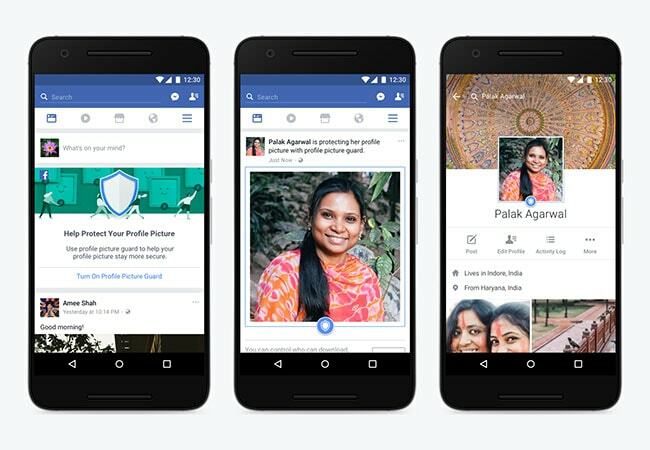 India is Facebook’s largest market and it’s also one of the countries which top the list when it comes to online abuse when it comes to teenagers and especially girls. Online safety is a cribbing issue forward mostly Indians themselves days. In light of the same, Facebook recently launches a new feature which is being tested as a pilot in India and will be rolled out to other countries as time goes by. The feature is called Profile Picture Guard and it helps users by protection user’s profile pictures from abuse. The feature works by disallowing sharing or downloading the profiling picture. You’ll still be able to screenshot their profiling picture but it adds an extra line of defense for users. The feature is rolling out gradually to users and you should notice the feature once you visit your profile page on Facebook via the mobile app. We already covered Snap’s latest acquisition of Zenly in a separate section above. Just after the acquisition, Snapchat was updated to boast a new feature. Snapchat’s next big feature wants to get you to meet up with friends in real life rather than just watching each other’s lives on your phones. Snap Map lets you share your current location, which appears to friends on a map and updates when you open Snapchat. It’s rolling out today to all iOS and Android users globally. 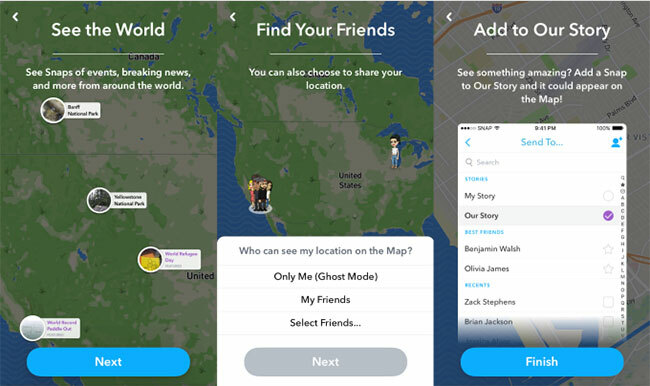 When you open Snapchat once you have access to the feature, you can choose to share your location with all your friends, a few friends you select or you can disappear from the map at any time by going into Ghost Mode or not opening Snapchat for a few hours. Alternatively, location sharing is turned off by default and you can leave it that way to just lurk, watching what friends are up to. To access the Snap Map, you pinch on your Snapchat camera home screen. From there you can scroll around to see where friends are in your city or around the world. Tapping on their “ActionMoji” BitMoji avatar opens their Story to show what they’re up to, or lets you message them directly to make meetup plans. Snapchat automatically picks an ActionMoji for you based on your location, time of day and other factors. Outside of the location-sharing element, Snap Map also gives users an alternative way to discover Story content beyond the well-worn Stories feed and the powerful but buried Story Search feature. Users can submit Snapchat Story posts to Our Story to be eligible for their content to appear to non-friends for around 24 hours. You also can see “heat” colors on the Snap Map to see where lots of Snaps are being uploaded, which might indicate a concert or big event from which you’d want to explore Snap Stories. When Google took the stage at I/O this year, they teased their new upcoming job search engine towards the end of the keynote. 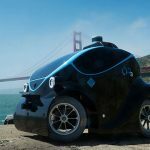 The company announced it as an AI-powered search engine where people will be able to look for jobs in the areas they live and in fields they are skilled in. Recently the company rolled it out to the masses. 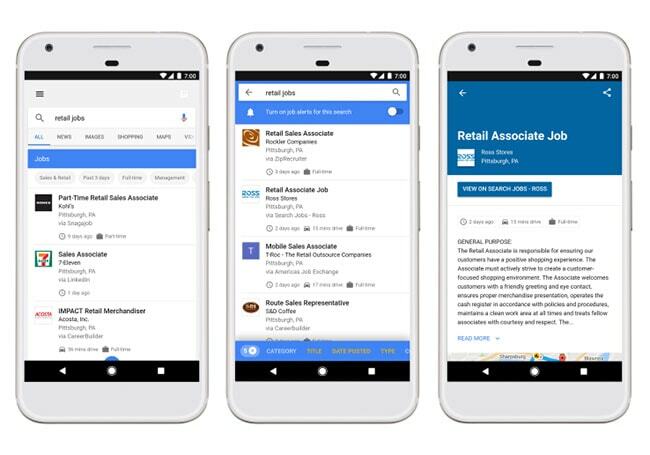 Google today launched a new jobs search feature right on its search result pages that let you search for jobs across virtually all of the major online job boards like LinkedIn, Monster, WayUp, DirectEmployers, CareerBuilder and Facebook and others. Google will also include job listings its finds on a company’s homepage. The idea here is to give job seekers an easy way to see which jobs are available without having to go to multiple sites only to find duplicate postings and lots of irrelevant jobs. With this new feature, is now available in English on desktop and mobile, all you have to type in is a query like “jobs near me,” “writing jobs” or something along those lines and the search result page will show you the new job search widget that lets you see a broad range of jobs. From there, you can further refine your query to only include full-time positions, for example. When you click through to get more information about a specific job, you also get to see Glassdoor and Indeed ratings for a company. You forgot to mention Amazon in this list. Amazon purchased whole food in this week. Reading all your articles for a long time and I would like to thank you for sharing such informative articles with us. Many thanks for paying the time to publish this kind of posting.